Each of the TBMs that will work on the project weighs about 1,212.54 tons (1,100 t), with a shield diameter of 278 in. (7,080 mm). Why will Mary and Sophia cross under the River Thames? It’s nothing to do with the old joke about chickens crossing the road, but rather the names of a pair of tunnel boring machines (TBMs) that will help create a new $25 billion (£16 billion) Underground line in London, England. 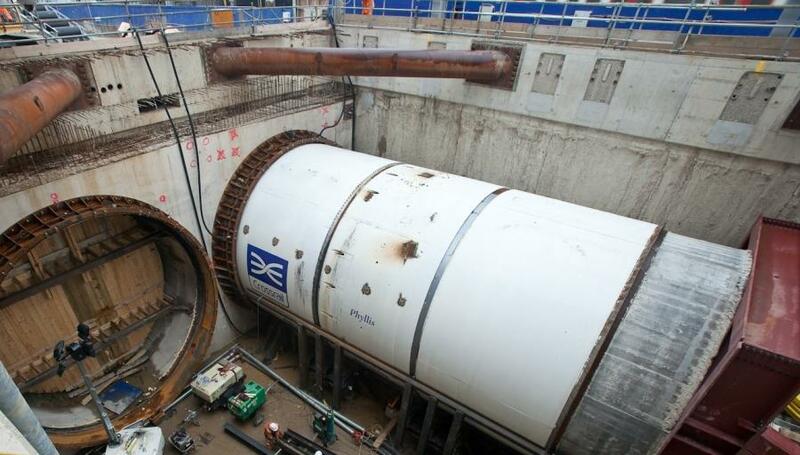 The massive project is proceeding under the aegis of Crossrail Ltd. The largest construction project in Europe at this time, the line will run 73 miles (118 km) from Maidenhead and Heathrow in the west to Shenfield and Abbey Wood at its most eastern point. In the process the line will pass through 57 stations, seven of them new and including two at major railway stations, Paddington and Liverpool Street. Completion will result in 1.5 million travelers being added to those within 45 minutes’ journey of central London. Opening in 2018, it is projected the line will serve 200 million passengers each year, with about 1,500 riders on each train during peak travel periods. Crossrail estimates that at peak production, the project will provide jobs for 14,000 workers in various capacities, including those who will supply materials. With 20 scattered small construction sites in London, more than 3,000 people are working directly on the project with many more jobs -- including 400 apprenticeships -- to come during the life of the project. Before any earth could be moved, in a nod to the construction tradition holding that a TBM must have a name for good luck before it begins work, a competition was held to name the TBMs, with the results announced in February 2012. The TBMs will work in pairs and the first are now known as Ada and Phyllis. According to Crossrail, Phyllis was named after Phyllis Pearsall, creator of that boon to tourist and resident alike, the London A-Z street listings. Ada is an homage to Ada Lovelace, who wrote what is regarded as the first computer program in her notes on Charles Babbage’s analytical engine, which Babbage designed in the 19th century with plans to utilize punched cards. o Victoria and Elizabeth, after Britain’s most famous queens. This pair will start their underground journey in the Docklands and go westward when they begin work in the summer of 2012.
o Mary and Sophia will be launched in winter 2012 from Plumstead on the south side of the Thames and tunnel some 49 ft (15 m) under the river bed to North Woolwich. This pair of TBMs are named after the wives of the celebrated civil engineers Isambard Kingdom Brunel and his father Marc Isambard Brunel respectively. At this time, no names have been announced for the final pair of TBMs. o For the western tunnels from Royal Oak to Farringdon, a Joint Venture comprised of Ferrovial Agroman (UK) Ltd, BAM Nuttall Ltd, and Kier Construction Ltd, which also will handle construction of early access shafts and sprayed concrete linings for the tunnels at Tottenham Court Road and Bond Street stations. o For the eastern tunnels from the Limmo Peninsula to Farringdon and Victoria Dock and from Stepney Green to Pudding Mill Lane, a Joint Venture formed of Dragados, S.A. and John Sisk & Son Ltd.
o For the tunnel under the Thames, a Joint Venture composed of J. Murphy & Son and Hochtief (UK) Construction. Each of the TBMs that will work on the project weighs about 1,212.54 tons (1,100 t), with a shield diameter of 278 in. (7,080 mm). 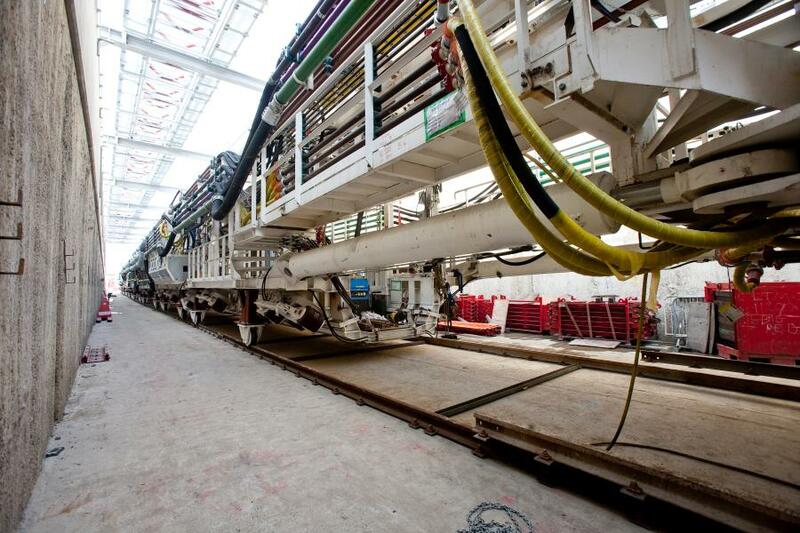 Staffed by a crew of 20 and equipped with a refuge chamber, cooking and bathroom facilities, the machines are about 153 yds (140 m) long, which Crossrail compares to the equivalent of a queue of 14 London omnibuses. Two categories of boring machine are involved. Since no British company manufactures TBMs, they are being provided by the German company Herrenknecht AG. Six are Earth Pressure Balance TBMs. They will burrow though a mix of gravel, sand and clay to construct the tunnels north of the Thames, while slurry TBMs Mary and Sophia excavating the Thames Tunnel will follow a route through land largely composed of chalk. Each TBM costs about $15 million (£10 million). Operating round-the-clock over the course of three years at a depth of approximately 43 yds (40 m), between them the TBMs will cover the 26 miles (42 km) long project at the rate of some 109 yds (100 m) a week, boring tunnels 6.78 yds (6.2 m) in diameter after lining segments are placed. Their positions will be tracked by the most advanced technology from the surface, enabling the huge machines to avoid such obstacles as sewers and the Blackwall and Limehouse tunnel link roads, not to mention ten Tube lines. In addition, thousands of monitoring instruments are installed across the capital to ensure any potential problems are nipped in the bud. As an indication of the massive amount of coordination to be carried out for the overall project, it is instructive to examine just one portion of it, in this case the eastern tunnels. As noted, these tunnels will be constructed by the Dragados Sisk Joint Venture (DSJV). The project will be managed by DSJV’s new office in Newham, east London. With a budget of $786 million (£500 million) for the two tunnels -- largely funded by the British government -- boring will begin at the Limmo Peninsula at the former site of the Thames Ironworks, the first shipyard to build iron ships. At present two 32.8-yd (30-m) deep shafts are under construction at that location, in preparation for the lowering of sections of Victoria and Elizabeth for assembly underground. 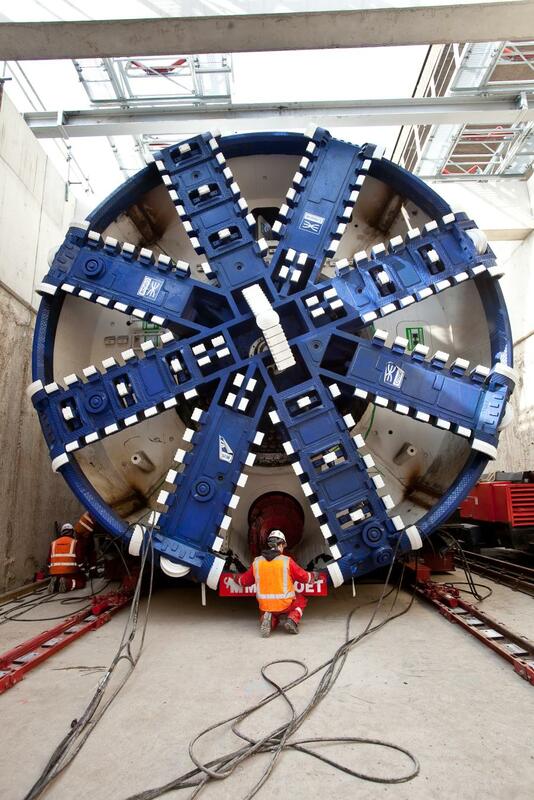 London’s Mayor Boris Johnson famously described the TBMs as voraciously nibbling away beneath London, and nibbling for the eastern tunnels will commence in late June or early July this year when assembly of Victoria, the first TBM to be delivered, will begin. In addition to non-construction staff, more than 100 subcontractors and suppliers representing a rich mix of British and international companies will be employed for the two tunnels. Among the subcontractors involved are Weldex, which will supply the TBM lifting crane. The two gantry cranes for the Limmo Peninsular shaft and a third crane for the shaft at Stepney Green will be provided by Industrias Electromecanicas GH, SA. These cranes will be used to feed the tunnel with lining segments and material such as pipes, rails, and so on, which will then be transported by underground railway to their destination. Auxiliary shaft sheet piling is by Dew Piling Ltd, and saw cutting by Kilnbridge Construction Services Ltd.
DSJV construction manager Gonzalo Rojo stated other equipment for the Limmo Peninsula job includes spraying robots from Meyco BASF, Liebherr excavators and loaders, and a drilling unit from Sandvik, with attachments by Wimmer. Lifting and lattice girder installation will be carried out by Normet Oy. “The high angle conveyors carrying the spoil vertically up the shafts will be provided by P&H Mining Equipment (Continental), an American company. Other important subcontractors include Zitron for ventilation fans and Valente SpA for rolling stock, while instrumentation and monitoring is by Geocisa UK Ltd, which is also handling ground treatment,” he added. Material suppliers include Cemex UK Ltd (concrete and grouting components) and ArcelorMittal, S.A. (steel fibers). Romtech Ltd are supplying lattice girders. Circumferencial and socket radial joint, bolt connections and grout sockets will be provided by Anixter Components Solutions. The eastern tunnels’ lining will be formed of 100,000 concrete segments. Weighing just under 27.5 tons (25 t) apiece and each comprised of seven 3.5 ton (3.2 t) segments and a key stone, they will be produced in the segment factory that DSJV will establish in Chatham, Kent, with concrete provided by Brett Concrete Ltd and carousels and molds manufactured by CBE. At peak activity DSJV’s facility will pour approximately 300 segments a day. They will be transported by barge to the Limmo Peninsula site. “The Crossrail project is fairly special in that a specific hybrid law was passed by Parliament to enable it to happen. The process of agreeing to this law, or Act as it is known in the UK, required the agreement of thousands of interested parties and it has a host of Undertakings and Assurances that we must comply with,” McDonald noted. “An example is that no truck is allowed on a Crossrail site unless it is fitted with a list of safety devices over and above that required by law and the driver has attended a special three-day training program run by Crossrail. It was challenging to get the supply chain to come to terms with this and to comply with this and it requires a lot of ’policing’ to achieve compliance,” he added. During the debating of the Act in the House of Lords, questions were asked relating to public health, with the parliamentary record showing Lord James of Blackheath stated his concerns vis-a-vis the area to be excavated near Farringdon Station included a mass grave where almost 700 anthrax victims were known to been buried. The disease arrived at nearby Smithfield Market in contaminated meat in 1520, as a result of which most of the residents in the area died. In reply to Lord James’ further pointing out that when the Metropolitan Line was cut in 1890 in similar circumstances a number of people died, the House was assured that the project’s design consultants along with specialists from the Museum of London Archaeological Services would manage the issue utilizing best practice measures. Fragments of human bone found during excavation were tested by the Health Protective Agency and no traces of anthrax were found. A less-dramatic matter relating to the project was the founding of the $20 million (£13 million) Tunnelling and Underground Construction Academy (TUCA) in east London to provide instruction to at least 3,500 workers in skills needed to work on this kind of project. 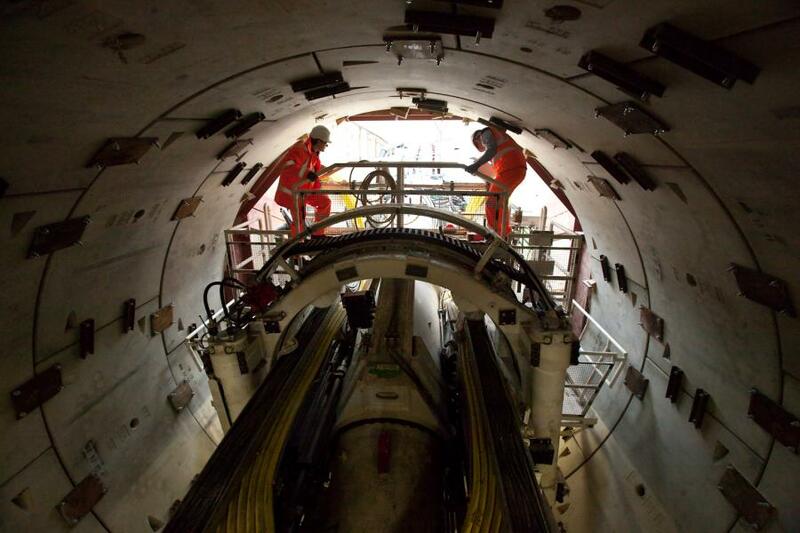 Opened in September 2010, it aims to overcome the current shortage of those with the necessary skills to work on the London Tunnel and similar projects in the UK. Before the Academy was opened the closest such institution was located in Switzerland. Initially there was some doubt about how long TBM delivery might be delayed because their main bearings are also in high demand at present for the expanding offshore wind turbine industry and also, due to conflicts involving the UK, for tank gun turrets. However, Herrenknecht AG possessed sufficient supplies of these parts and was able to produce the initial order faster than anticipated. Finally, about (4.5 million t) of spoil, representing about two-thirds of the material excavated during the life of the project, will be used to create a new wetland nature reserve on Wallasea Island in Essex, northeast of London, in partnership with the Royal Society for the Protection of Birds (RSPB). Most of the material excavated will be transported by boat or rail, thus avoiding further congestion of London’s busy, crowded streets. The first shiploads are expected to arrive at the island in the summer of 2012. Spanish company Dragados, S.A., specializes in global heavy construction. It is currently working on two projects in the United States, where the largest TBM in the world will be used on the Alaskan Way viaduct replacement tunnel project in Seattle. Their other American project is the East Side Access tunnels in New York. International construction company John Sisk & Son Ltd is based in Ireland. Recent projects include an extension to the headquarters of pharmaceutical services provider Ashfield In2Focus in Leicestershire, England and a new VIP facility in the UK’s Birmingham Airport currently under way.